If you live in a northern climate, tomorrow marks the first real day of hunkering down for the cold, cold winter with nothing to look forward to until spring. We used to have the new season of Deadwood starting up in February, but HBO killed it. Now there’s nothing. 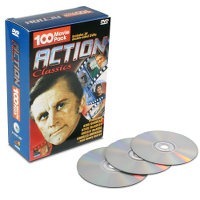 If you’re down with old-school movies, though, Hammacher’s selling 100 – count ‘em – 100 action films spanning 24 double-sided DVDs for $45. These are movies from the 1920s through the 1990s, when men were men and the women were too. There’s also a collection of 100 Westerns available for $45 as well.